One of the oldest forms of ornamentation, jewelry has always allured us because of its intoxicating combination of design, beauty and finesse. Every piece of jewelry adorned has been done with the intent of significantly adding aesthetic value and donning luxury on oneself. Every piece of jewelry designed has its small bit of history forged into it. Every design comes from the creativity and ingenuity of a jewelry designer. With a vivid fashion scenario and want of every consumer to define his/her own individuality by their fashion state, the element of design plays a pivotal role in bringing every consumer closer to achieving that. Jewelry design offers a professional approach towards the mode of creating jewelry. Armed with the technical know how a designer can now manipulate various elements to bring out his/her signature or unique product that every customer desires. A trained jewelry designer would know the scope of his skill application rather than arduously experimenting to establish his self-taught boundaries. Simplicity ‘also’ sells – The first thing people think about jewelry design is intricacy and an eye for extreme detail. Contrary to that thought the ‘simple and elegant’ have always prevailed and been around. As contemporary trend incorporates more of minimalism; simplicity has further found a facade to grow. The need to always be creatively ingeniously in designs can sometimes take a backseat. There is the reason why that simple pearl necklace appears to be so beautiful. Wide scope of application – jewelry as product does not just confine itself to the category of ‘clothing and accessory’. From pieces of art to mobile covers, whenever there has been a need to add finesse or glamour to any product, gems and jewelry has been the maker’s first choice. Always in an exhibition – As jewelry is purchased with the intention to advert attention towards you, it never falls short of a platform to display itself. Every jewelry designer that sells his/her creations would inadvertently be exhibiting his/her creativity through their patrons; resulting in prospects inquiring about. As a result, talent here receives comparatively quicker recognition. Benefits of changing trend – Fashion keeps incessantly evolving from one trend to another. 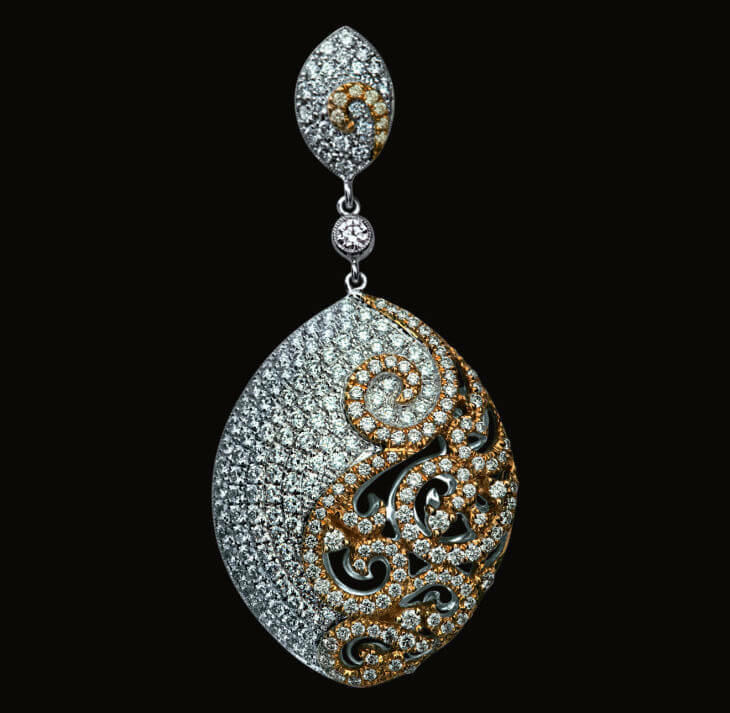 As jewelry designs are a part of ever changing scenario, the scope of innovation is quite vast. Designer can mix and match contemporary and classic trend or simply evolve with the tide of changing trends. The altering trend ensures the designer have a continuous foothold in the industry. Reach to all sect of the society – One of the advantages jewelry designer have is that they can work with a wide array of raw materials. Jewelry can be made from the most inexpensive materials to the most rarely occurring metals and stones. As a result, designers just do not have to focus a niche income demographic. Low ‘age’ sensitivity – Unlike apparel and other fashion products, jewelry is not highly sensitive to the consumer’s age. A single design made can cater to consumer of various ages. Demand in every corner of the globe – Every country has a demand for jewelry! Sure, the purchasing power as well as the cost element would not be the same but this does not rule out the scope of a designer. Huge market online – As e-commerce expansively grows, jewelry happens to be among the top 12 things sold on the internet. The figure is clearly the indication of the share of jewelry as well as relevant products in the online market. With the growth of e-commerce, geographical barriers are now overshadowed thereby broadening the horizon for designers. Unlimited permutations and combination – As design cannot be limited to a single idea. A jewelry designer can create whatever tickles his imagination. Jewelry design has been fused with watches, furniture, clothing, modern art; you name it and it has been done. Limit to plagiarism [Precious metals and gems] – Every creative industry suffers from continuous plagiarism. Every niche apparel and designer label is subject to mass plagiarism. Due to the nature and cost of certain products, mass plagiarism is quite uncommon in the jewelry industry. As a result, designer can operate and work in a much creatively secure environment. Everybody pays for it! – Unlike other expensive products, customers actually go a mile to save up to buy precious piece of jewelry. This leaves a conducive market for designers who are into designing precious jewelry. Does not lose value [Precious metals and gems] – With the passage of time as well as ownership most consumer products lose their value. Designs made of precious metal as well as gems however, tend to appreciate or rarely fluctuate in value. The customer and the designer hence find themselves in a win-win situation. Branding – ‘Half the battle for being a niche is already won’ – Designers working on precious jewelry can already justify a reason for high priced product. Since the costs of raw material are high they do not have much of a struggle in demanding a steep price for their work. Leaving a legacy jewelry and precious ornaments become a part of legacy of many consumers. They are passed on from generation to generation ensuring that the creative input of the designers stays for long. Overall, it can be said that studying jewelry design is no doubt useful in this modern age. The people are highly benefited study jewelry design as the jewelry design is used popularly in our society. The discussed reasons express the real advantages and importance of studying jewelry design. It has been more flexible compared to past due to the online opportunity of learning. Anyone can now study about jewelry design easily through internet. Therefore, the people are not studying more compared to past and this trend will even be continued in future as the people now understand very well about the advantages of studying jewelry design.